When working with exponentials you must understand the Laws of Exponentials. 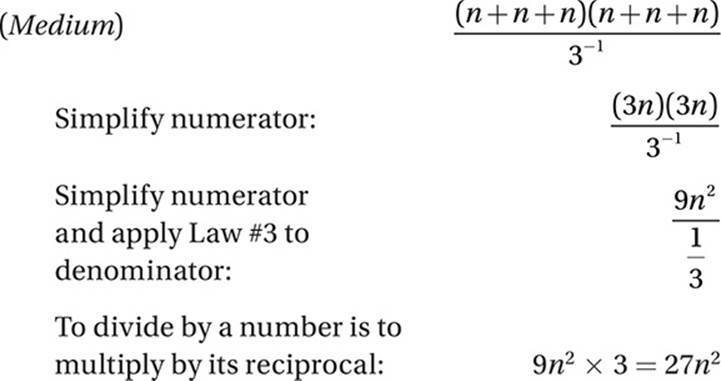 Law #1: If n is a positive integer, then xn means the result when 1 is multiplied by x repeatedly n times. And so on. If you explore this pattern, and patterns for the powers of other numbers, you will notice that some other laws clearly emerge. Law #2: As long as x does not equal 0, x0 =1. You can think of x0 as meaning “1 multiplied by x zero times, or not at all.” Therefore, the result is 1. Law #3: If n is a positive integer, then x–n means the result when 1 is divided by x repeatedly n times. This law follows from the Commutative and Associative Laws of Addition. Law #10: If x >1 and xa = xb, then a = b. Which of the following expressions is equivalent to ? Therefore, the correct answer is (D). Which of the following expressions is equivalent to for all values of n? Therefore, the correct answer is (B). Alternately, we can plug in various values for n and find that the expression gives a value of n no ­matter what. The radical symbol ( ) is used to indicate roots, which are the inverse of exponentials. For instance, because 23 = 8, we can say that 2 is the “third root” or “cube root” of 8 ( ). 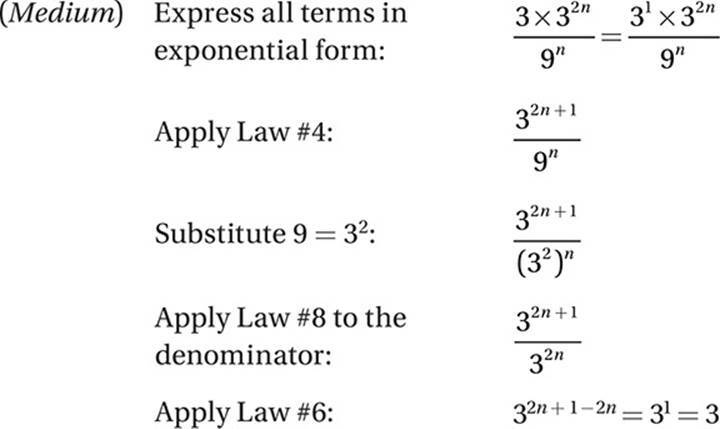 Law #9 of exponentials shows us that radicals (or “roots”) can be expressed as exponentials. For instance, . Therefore, we can use the Laws of Exponentials to simplify radical expressions. 82 = 64, 92 = 81, 102 = 100, 112 = 121, 122 = 144. . . This will help you both simplify and estimate radical expressions. • If the radicand has a perfect square factor, the radical can be simplified by factoring. • If a fraction has a radical in the denominator, eliminate it by multiplying numerator and denominator by the radical. • To estimate the value of square roots, notice which two consecutive perfect squares the radicand lies between. (Medium) Notice that each answer choice is much simpler than the original expression. This suggests that the original expression can be simplified. Let’s begin by looking at the radical expressions. If you know your perfect squares you will see that neither radicand (the expression inside the radical) is a perfect square, but one of the radicands—18—is a multiple of a perfect square: 18 = 2 × 9. If x2 = 4, y2 = 9, and (x – 2)(y + 3) ≠ 0, what is the value of x + y? Every positive number has two distinct square roots. For instance, both 5 and –5 are the square root of 25, because (5)2 = 25 and (–5)2 = 25. However, the symbol means the principal, or non-negative square root, so and not –5. (Easy) If x2 = 4, then x = ±2, and if y2 = 9, then y = ±2. But if (x – 2)(y + 3) ≠ 0, the x cannot equal 2 and y cannot equal –3. Therefore, x = –2 and y = 3, and x +y = 1, so the correct answer is (C). If , what is the value of k? If , what is the value of y3? Therefore, the correct answer is (A). If 2a2 + 3a – 5a2 = 9, what is the value of a – a2? If (200)(4,000) = 8 × 10m, what is the value of m? If 2x = 10, what is the value of 5(22x) + 2x? If , where a and b are integers, what is the value of a +b? If , what is the value of ? If 9x = 25, what is the value of 3x–1? Which of the following is equivalent to for all positive values of n? Which of the following is equivalent to 3m + 3m + 3m for all positive values of m? 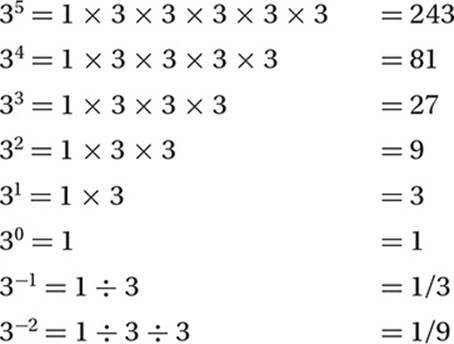 If x is a positive number and 5x = y, which of the ­following expresses 5y2 in terms of x? If and n > 0, what is the value of n? If (xm)3(xm + 1)2 = x37 for all values of x, what is the value of m? If , what is the value of n? Which of the following is equivalent to for all positive values of x? The square root of a certain positive number is twice the number itself. What is the number? Which of the following is equivalent to for all positive values of m and n? In the figure above, if n > 1, which of the following expresses x in terms of n? 5. 64 If (x + 2)(x + 4)(x + 6) = 0, then x = –2, –4, or –6. Therefore 2–x could equal 22, 24, or 26. The greatest of these is 26 = 64. Therefore a = 48 and b = 32 and a + b = 80. Substitution and checking makes it clear that m = 5 is the smallest integer that satisfies the inequality. Therefore, x must be both greater than 1 and less than or equal to 1.56.